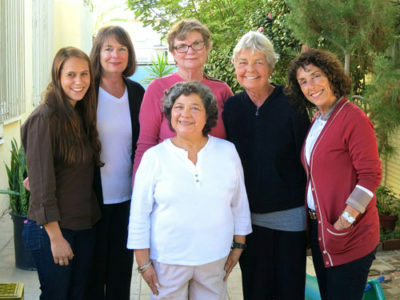 TEACHERS AND STAFF MEMBERS feted retiring Plymouth School founder, Penny Cox (second from right) at a gathering in July. From left are Amber Heron, Donna Marie Carolan, Fran Nentz and Ria Raders. Olga Maldanago is in the front. Taking the advice of one of her former teachers who retired after 25 years, Penny Cox plans to be out of town when classes start on Sept. 15. “She warned me that that will be the hardest time,” said Cox, who founded the Plymouth School with four others in 1972. “But I’m going to be 82 soon, and it’s time,” said Cox. “It’s past time,” she laughed. 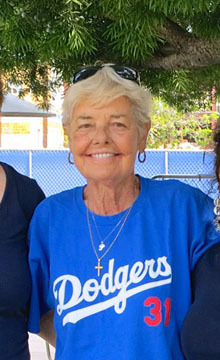 Cox recently stepped down as director after 42 years at the nursery school that originally opened in the United Methodist Church on Wilshire Blvd. and later moved to its current location in the Wilshire Presbyterian Church on Oxford Ave. She was feted by parents, current and former students and teachers at an end-of-the-year gathering in July at Harold Henry Park. Taking over for Cox is Megan Drynan, a former Plymouth student. Drynan’s one-time classmate, Maureen Gonzalez, is the school’s administrator. Now settling into retirement, Cox said her plans include “a lot of sitting and reading”—something she hasn’t had much time for in the past. Leave it to a former student to put the idea of retirement into perspective for her. “This little boy about 10 years old came by to say goodbye, and he said, ‘so what are you going to do now, Penny?’ ‘You know, I don’t really know,’” I replied.